The Lemon Bottlebrush garden brings attention to a wide range of water conserving plant species that come from Australia and South Africa. For this palette, the Lemon bottlebrush is the signature tree that easily combines with many good companion plants such as Little John bottlebrush, Kangaroo paws, and Pink melaleuca that also come from Australia. The Medicinal aloe, Coral aloe and Blue fingers come from South Africa and diversify this palette with their bold colors and succulent character. 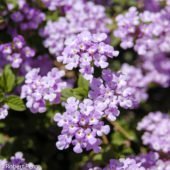 This list includes many plants that are well sized to fit residential scale garden spaces and that grow with low maintenance needs. Plants included in the Lemon Bottlebrush palette are all adapted to sunny conditions, summer heat, winter cold, and low amounts of supplemental water during the summer. Some of the foliage plants will benefit from protection from hot afternoon summer sun while succulents respond to the sun with more intense foliage colors. The aesthetic character of the Lemon Bottlebrush Garden can become very intense and bold due to the coarse textures, hot colors and diverse shapes among the various plants. Both festive and dramatic planting combinations can be achieved for year around interest. The chart shown below provides a baseline guide to the monthly irrigation schedule and volume of supplemental water needed throughout the average year. The high and low range of this irrigation schedule indicates these plants can grow with varying amounts of water depending upon exposure conditions and maturity of plants. Rains during the winter months noted by an asterisk (*) can provide sufficient moisture to eliminate the need for winter irrigation.